There are many advantages to have our own custom domain rather that default Blogspot / Wordpress domain. It'll also help you to get fast approval of Google Adsense. Which obviously is not looking as good as custom domain. So, there are many companies offering free domain either for year / Life time. It depends to company. For Example :- Dottk and codotvu are few of the many companies which offers free domain. But, here for Dottk you can have only the custom domain name ended with the .tk and for codotcu your custom domain will be ended with co.cu ! 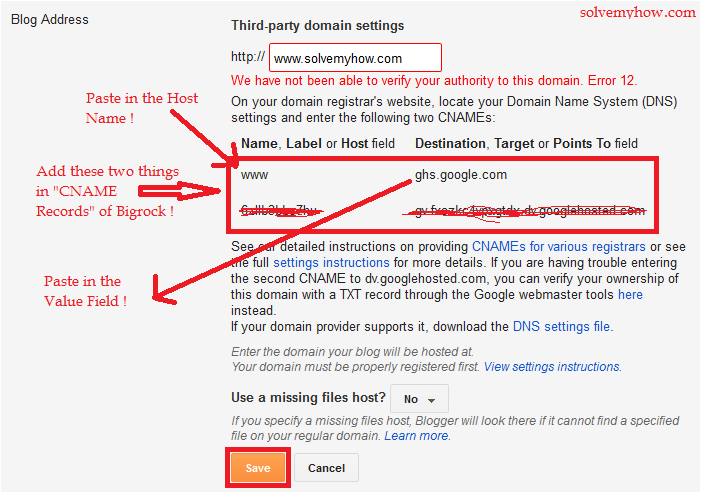 How to Setup Custom Domain in Blogger with BigRock ! Step 1 :- Visit Bigrock and register your domain ! If you've already registered your domain at Bigrock then please skip this step. Step 2 :- Login with you Bigrock account and select your domain ! Step 3 :- Look for "DNS Management" and then Click on "Manage DNS" ! Step 4 :- Now one popup windows will appear. By default "A Records" will be selected and then just click on "Add A Record" ! Here you'll find 2 Name with the particular Destination IP Address. Note:- To delete the entry/Name just click on NAME ! Step 5 :- Keep "Host Name" empty and in "Destination IPv4 Address" add Google Server's IP Address 216.239.32.21 and then click on "Add Record" ! Step 6 :- Repeat the above step 3 more times ! So, total 4 Name and Destination IP Address would be there. 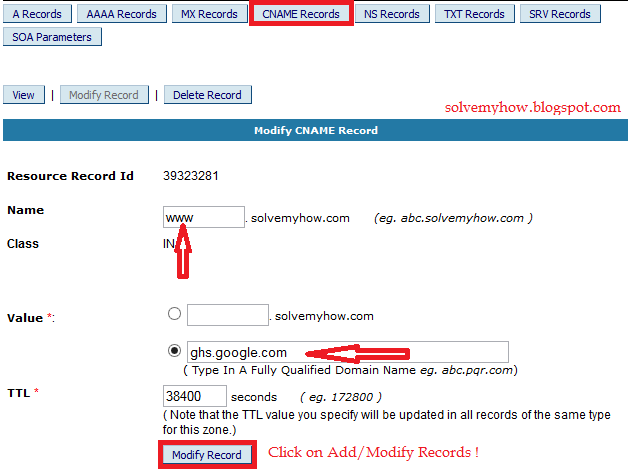 Step 7 :- Now you need to set the "CNAME Records". So, for that go to Blogger and Login in it. Now go to Settings >> Basic. Then click on "+set up a third-party URL for your blog" ! Step 8 :- Here just type your Custom Domain name followed by "www" and save it. Then Google will generate one error message ! Error message contains 2 fields. 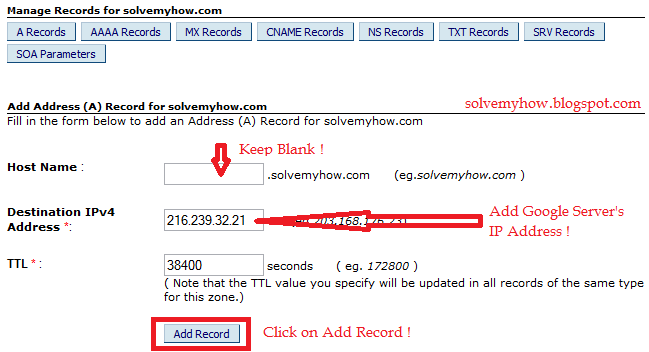 Just copy it and again go to Bigrock and change the "CNAME Record" . Step 9 :- In CNAME Records >> Add CNAME Record. Copy Those two Google field values as shown in the snap shot below. I've shown the snap shot for one value, Please repeat the same thing for another value. Step 10 :- Go to Blogger >> Settings >> Basic and repeat Step 8. This time Google won't generate any error message if and only if you did the setting perfectly/properly. Then, Just Click on Save ! Usually your Custom Domain with DNS Settings is updated instantly but, in some cases it might take upto 2-3 hours ! Hi, Came from IndiBlogger. You covered the topic nicely but I would like to share with you that Google is not approving .tk type domains any more. And in addition to this; despite of the fact that you have a top level domain or a sub domain you need your blog to be 6 months old. You might have mistaken because Google is still accepting .tk domain AboutStarsLife . Secondly, Yes Google needs your blog should be at-least 6 moths older but You can apply for adsense directly if you have Top Level Domain only and yeah don't forget to use profession email id's while applying for adsense. You'll get fast approval of adsense. That worked ".cf" as well !! thank you so much!! but I’ve confusion that is it affect blog’e seo and alexa rank ? means i have a blog with blogspot domain with good alexa rank and after switching custom domain will my alexa rank and seo remain same or it decrese ? nice question and i appreciate your concern. But let me tell you something, when you switch to third party domain your alexa and SEO will improve. Even Google adsense accepts faster request of sites having custom domain specially with .com extension. So, no it won't affect your alexa + it will improve your SEO as you increase your domain authority more and more. And after all you have to move someday then, why not today ? PS don't forget to submit sitemap again to Google webmaster tools. So, google can index your custom domain blog post's. do let me know if you are facing any difficulty in doing that, I would love to help you. suppose I have a blog with "xyz.blogspot.com" and i want to register "xyz.com" but xyz.com is already expired or deleted domain and available now so what should i do, go for it or buy a new one ? and i dont want to go with ".net/.org"
and nice question. See vinay its always a good idea to buy expired domain related to your niche. You get higher ranking automatically + Domain authority will also be good as it is expired. So, it might happened that links are also coming to that domain. So, if you are getting that kind of domain, you should definitely buy it. PS: vinay don't forget to check, it is not penalized by Google. If you have any more query, feel free to comment. thanks for the reply and explaining me this doubt..
and must say keep sharing such a nice articles .. Yes vinay. Like if wanted to see real time traffic + acquisitions reports, then you must replace your GA code with the new one, else it will show you your .blogspot.com reports ! after setting up custom domain is it necessary to fetch all posts as googlebot in webmasters manually to get quick site linking ? Thank you for your kind words. Vikas setting third party domain will improve your SEO + authorship too. Your blog will look more genuine and legal. So, go and set up. And yes you again have to "add property" in webmasters for your third party or custom domain. Fetching is automatic. i have used "000webhost.com" and used free domain as "tutorials.tk" so how can i map "tutorials.tk" to "demo.tutorials.com"
Thanks for dropping by and commenting. Ankit I'm not sure whether free domain providing companies allow sub domain or not. But if you have custom paid domain then its very easy. Here I'm taking an example of big rock only. Now one pop up will be open and give your sub domain hostname for example "contact.xyz.com" just copy cname records. Make connection with blogspot as shown in this post. That's it you are done ! what this value means = TTL : 38400 ? how much time it takes to update blogspot domain to custom domain, and how many sub domain we can create in bigrock ? Well 38400 is 10 Hours and 40 mins and normally this is default in DNS settings because it is not very long for TTLs propagation and not short for too frequent DNS refresh. Time normally 2 hours and big rock allow free 2 subdomain ! Every company is giving more that 1 IP address, just in case if one server fails. So, that's you need to write 4 IP address / CNAME records. Buddy I would say kindly remove .blogspot.com domain because now you wanted that google index your top level domain only. So, don't confuse google in ranking your post.